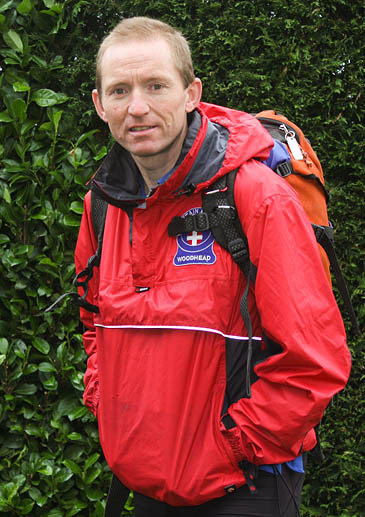 Ian Winterburn is a fellrunner. He’s also a qualified Mountain Leader and member of the Woodhead Mountain Rescue Team in Yorkshire, so he knows quite a bit about what happens when things go wrong on the hill. 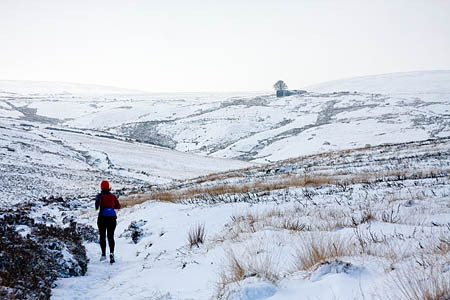 Ian wrote the following article about the dangers of hypothermia with runners in mind, but its insights are useful for all of us who venture into the great outdoors, especially as the colder months have arrived. It is well known fellrunners do not like carrying heavy spare kit. We want to feel free in the elements and be as unencumbered as possible. For most of us keeping cool on a big climb is generally more of a concern than how to keep warm. Red faces and sweaty bodies are nature’s way of regulating our temperature in such conditions but as we know they can only go so far and we sometimes need to provide nature with assistance to cool ourselves down. Our bodies have converse methods to keep us warm when we actually reach the top of the hill or pause to eat. Again, while very efficient, and really quite a feat of engineering, our bodies can only do so much to combat the cold. Hypothermia is the dominant cause in most fellrunner deaths. It is also, if not the prime cause, then a secondary concern in many mountain rescue callouts. 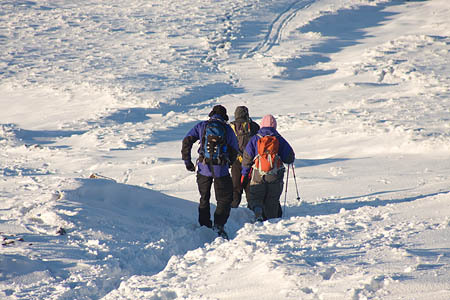 On the hill the condition is generally seen as exhaustion hypothermia. This is an insidious condition: it creeps up so slowly that its victims do not notice the symptoms of its gradual onset. 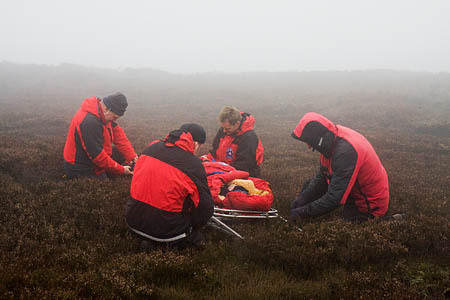 The alternative, immersion hypothermia, is brought about by sudden heat loss typically caused by falling in water – or a particularly large bog. When heat is allowed to leave our bodies without being replaced the temperature will drop. 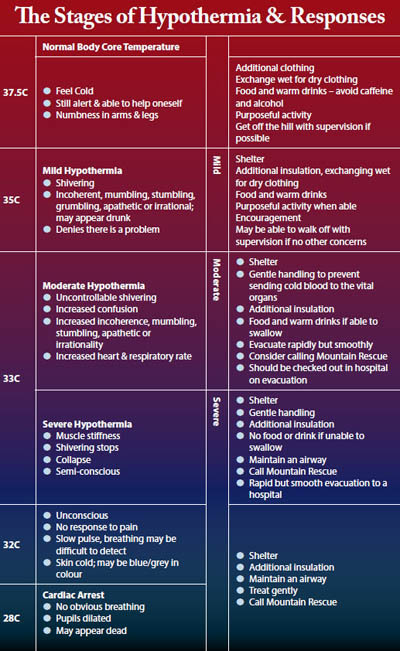 A very small loss is all it takes for the early stages of hypothermia to start to take hold. This is something we will all have experienced at one time or other and is characterised by the shivering that we all recognise as our bodies’ way of telling us to put on an extra fleece, eat something sugary or drink something warm. However, shivering while running is not reliable as it is hard to shiver and run, thus while running and losing heat the runner may lower their core temperature significantly and only start shivering when they stop. Feeling cold, poor decision making, poor concentration – eg navigation errors, fatigue, and irritable mood are also all early signs. The body’s energy needs also increase in mild hypothermia because the sugars are used to create heat, and by the muscular effort of shivering. Heart rate and breathing initially increase to help with the increased demand, but then reduce as shivering stops. Shivering cannot be absolutely relied upon as an indicator of cold as pain from an injury may prevent it, so making sure an injured person is kept warm is important both in terms of preventing shock and hypothermia. Once the body is down to 35C it is now suffering from mild hypothermia. As your temperature drops the body decides that it is fighting a losing battle in trying to raise the temperature of the whole so concentrates its efforts purely on survival. As the body cools further, shivering will stop. The body is now becoming severely hypothermic. You will stop shivering but not because you are getting warm. Blood will be drawn into the core. Heart rate and breathing will slow down. As blood cools it becomes more viscous, takes more effort to pump round and is less able to carry oxygen. Without sufficient oxygen the body cannot metabolise sugars so energy levels drop further creating a vicious cycle. Being dehydrated will exacerbate the problems. As the cooling continues the victim may become incoherent and display ‘the umbles’: grumbling, mumbling, stumbling, fumbling, tumbling, and become apathetic or irrational. Skin will become pale and clammy – remember to check under clothing as well as the exposed bits. It may sound like a parody but lips and fingers really do turn blue. Blood should usually take two seconds to return to the skin on a fleshy extremity after pressure is applied with finger and thumb. If it takes longer than this it is an indication circulation is slowing down. Below 32C, consciousness is often lost and the heart beat can become irregular. The body no longer has the energy to make the muscles work to generate heat so stops trying and releases the blood it has managed to keep warm into the full circulatory system. It is this that results in the phenomenon of a hypothermic person sometimes taking off all their clothes and complaining of being too hot. At 28C a cardiac arrest is almost a certainty. Well first, remember you are the most important person there. Helping others is all very commendable but creating a second victim by getting cold yourself will help no one. 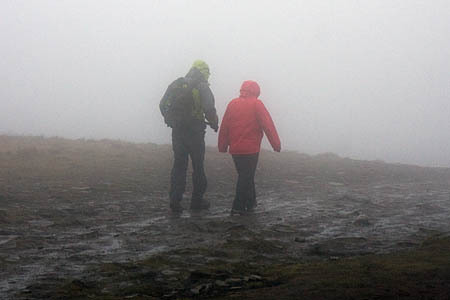 Prevent further heat loss by putting on dry clothing, find shelter, insulate from the ground and rewarm the body slowly. Don’t forget to remove wet clothing; the body cools much quicker when wet. Get off the hill if possible. Do not apply direct heat, eg heat pads, standing in front of a fire, sitting on a radiator. Warm, sweet drinks, high energy food and gels will help replace lost energy and warm from the inside out if the casualty is able to swallow. Do not give alcohol or caffeine. Treatment and movements should be gentle as rough handling, rapid movements and vigorous rubbing can cause cold blood to rush to heart and brain. This is likely to cause ventricular fibrillation – otherwise known as a cardiac arrest. If the casualty is unconscious check the airway, but if you cannot find a pulse do not attempt resuscitation unless you can keep up cardio-pulmonary resuscitation until you can get to a hospital. There is a mountain rescue adage that a hypothermic victim is not dead until they are warm and dead. Survival rates from hypothermia can still be quite high even for those found with no apparent signs of life. Basic physics states that energy can be conserved and converted. 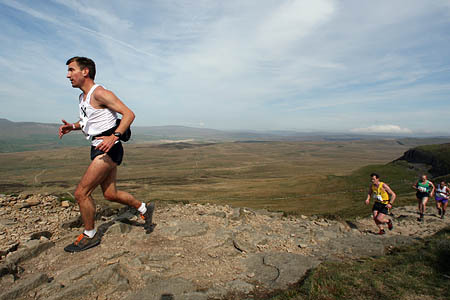 In fellrunning terms that is: wearing the right clothes and eating the right foods. Make sure you take on enough food before and during a run. Recognising when you need to take in more food and water, when energy levels are dropping and you are in danger of pushing yourself too far is key, not only to improving performance but, preventing hypothermia. It’s worth bearing in mind that if you are recovering from an illness, particularly cold or flu, you are much more susceptible. Make sure you understand the gradual effects of cold and make allowances for windchill. 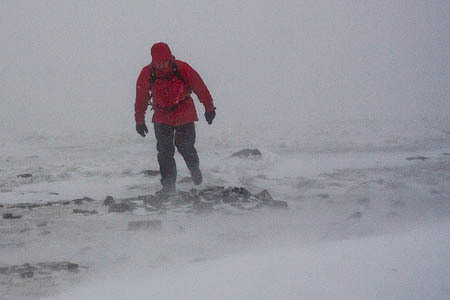 Warm, dry clothing is important in staving off both immersion and exhaustion hypothermia. Pay particular attention to the extremities, especially head, neck and hands. When checking for a pulse, it is particularly important to keep these ‘arterial’ areas warm. They have a high volume of blood, close to the surface of the skin. Think how we instinctively tuck our chins on to our chests and hide in a high collar when it’s cold, but ‘expose’ our necks when it’s warm. These are examples of the body instinctively doing the right thing. We have all seen runners on cold days in vest and shorts that must use more energy keeping warm than keeping their legs moving. 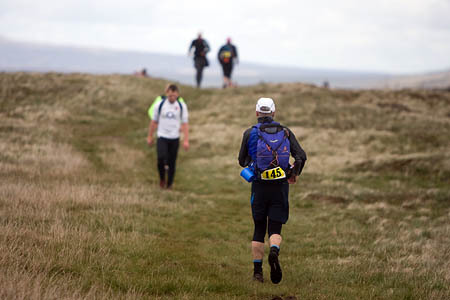 Minimum kit levels are decreed by Fell Runners Association race rules but consider whether minimum kit is sufficient for your needs and then use it. 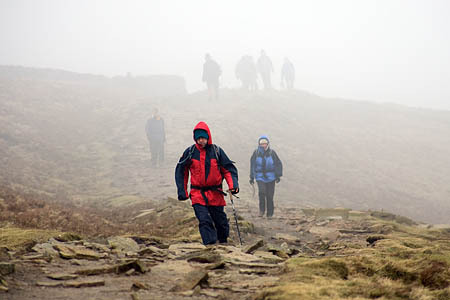 In the 2007 Edale Skyline a number of runners were afflicted with hypothermia despite carrying minimum kit. In some cases it was because they were indeed carrying it rather than wearing it and eating it. Marshalls reported having to dress and feed runners because fingers were no longer capable of opening a bum-bag or gel pack. Interestingly, this occurred more with faster runners, who presumably thought they were not going to be out long enough to get hypothermic or were generating sufficient heat through their running, than the slower ones. In respect of other kit, survival bags are better than blankets for retaining heat. Plastic backed foil does not tear as easily as foil on its own whilst retaining a weight benefit over plastic alone. Remember however foil only works with reflected heat. If you are very cold, there is little heat to be reflected back. If you are going out as a group think about sharing the weight to include a group shelter and emergency kit, especially at night. It can take experience and a brave decision not to push on, especially when in a group. Always work to the ability and condition of the weakest member of the group and perhaps arrange a buddy system to make sure everyone has an eye kept on them. In any combination of wet, wind and cold be more cautious. These are the killers. As a general rule, if conditions are such that you have to ask whether to go on, the answer is probably ‘no’. Many thanks to the doctors and medics of Woodhead Mountain Rescue Team for their input in verifying the technical details and to my fellow fellrunner for his honesty in providing the case study below. This incident happened at Tanky’s Trog as remembered by those who were there. Around Hey Moss before the first checkpoint I took a dunking in a bog. I went in over my waist but as I was running the momentum of moving forward caused my body to flop forward when I was already waist deep. As a result all the front of my chest and neck became wet. I got out and carried on through checkpoint one over the road and towards Lawrence Edge. As we started to climb up we were hit by the hailstorm. I started to feel a little cooler but not cold. Once at the top we started running again. I started feeling tired and lethargic. I thought I was starting to bonk a bit so I had some jelly babies and an oat biscuit – during this time we (I was running with my mate Chris; we had agreed beforehand to stick together) slowed down to a run-walk. I was feeling OK apart from having no energy. Chris was talking to me and said I seemed ‘normal’ but I couldn’t shake off the lethargy and get moving properly again. We stopped for a minute and I put on my mountain windproof over my other tops. I already had on two long sleeved tops, club vest with my OMM smock over the top as well as a hat and tights. We then saw a mountain rescue guy about 1km from Snake Pass. We stopped and spoke to him for a minute and he gave me half a cup of coffee. After drinking the coffee I felt a lot better; unfortunately it didn’t last long. I then told Chris that I was going to retire at the next checkpoint as I didn’t feel up to it. Once at Snake Pass I told Chris to leave me and that I would make my own way down the road to checkpoint two. By the time I got to Birchen Clough car park I felt lousy. Being a cheeky bugger I asked a guy in a Saab estate, who was supporting some other runners, if he would give me a lift to the Snake Inn which he did. Once there I retired from the race and went inside to keep warm. In the pub I stripped off my wet tops and put a dry one on, got a coffee and some food from the bar – glad I didn’t get a pint or who knows what state I would have been in. I stood next to the fire to warm through – this was a big mistake. Once by the fire I started shivering slightly; this was the first time I had shivered all day. The shivering became a bit more violent. I ordered another coffee. Shortly afterwards one of the mountain rescue medics came in. The barmaid was a little bit concerned about me and asked if they could check me out. I agreed to this. I then heard a voice say: do you realise your face and lips are blue? ‘No’, was the answer. Then someone asked me to stick my tongue out, and I heard someone say your tongue is blue. I am not a doctor but I know that wasn’t a good sign. The MR medic and doctor put their hands in to my armpit and said I was very cold. The next five to 10 minutes are a bit of a blur but I remember been asked if I minded stripping off my damp socks and leggings and putting some more dry clothes on. Again I agreed and before I knew it I had been stripped and redressed in dry warm clothes, moved away from the fire, my feet elevated and I was given two sweet cups of hot chocolate, had a gel pack squeezed in to my mouth and a temperature probe shoved under my arm pit. My core temperature was recorded at 33.4C – not good. In among all the above a brief discussion was held by the mountain rescuers about calling the air ambulance out – thankfully it didn’t come to that. On reflection hypothermia snuck up on me. Chris and I kept talking to one another and looking out for any symptoms as we ran but there were not the obvious ones like shivering, confusion, slurred speech. With hindsight other more subtle symptoms were there like coldness, tiredness and lack of energy but these can also be the product of a day out on a cold hill….. The casualty had already been seen by me in the car park and I had offered him a blanket which he refused. Interesting how he can’t remember talking to me and the team doctor after being dropped off. He sat right in front of the fire which caused a rapid redistribution of warm and cold blood causing classic ‘after drop’. His two cups of coffee were espresso, the caffeine content of which would help along the hypothermia by stimulating him further. Caffeine, like alcohol, predisposes a person to hypothermia. The lift in the car would have further added to the cooling process as he had stopped exercising. Humans are homoeothermic: we generate heat through exercise. The lethargy he describes is the early onset symptoms of hypothermia. By the time he hit the pub he was probably heading into the second stages which had been helped by incredibly rapid rewarming in front of that fire. Being a fit fellrunner probably helped fight off unconsciousness; less fit individuals might not have been so fortunate. He was given sweet warm food and drink, glucogel (23g 40 per cent dextrose), and changed wet for dry clothes and put into a casualty bag – a big fleece sleeping bag – at the back of the pub away from the fire. The doctor will concur that the casualty was borderline severe hypothermia, and if left untreated would most probably have lost consciousness in the pub – it was his fitness that kept him fighting on so long. Read more of Ian Winterburn’s contributions on his Everything Outdoors website. Never suffered hypothermia in the hills thankfully. I was however, completely unaware of the risk of secondary hypothermia from warming up too quickly. Very important information.